Ice cube is a natural way to enlarge your lips. It flakes off the dead cells. Rubbing with ice cube improves blood circulation and lightens the lips. Massage your lips with an ice cube for 2 minutes daily. Gradually your lips will be smoother and fuller. Honey is rich in antioxidants, vitamins, minerals and other healthy nutrients. Honey helps in lightening your lips. Keep applying honey on your lips couple of times in a day and leave it for at least 10 minutes. You can also leave it on your lips before going to sleep every night. Honey hydrates nourish and softens your lips deeply. It protects lips from drying and gives you fuller lips. You can make your lips look bigger and beautiful by brushing them regularly. It has many benefits. It gradually changes the shape of your lips. Brushing your lips remove dead skin cells and awakens the blood flow. This makes lips look reddish and fresh. 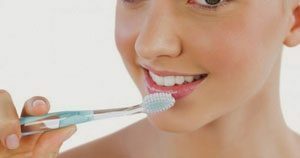 Note that you do not brush hard or more than 60 seconds. A smart exfoliation can give you fuller lips. Make a scrub by adding sugar with some water. Start massaging your lips with this mix. Rub it all over the lips but not more than a minute. This helps in removing the dead cells, evens out the skin, and makes lips smoother. Wipe out with a tissue. Apply a natural moisturizer. Do this for just two times a week. Essential oils are not expensive. Apply them to get fuller lips. They are not permanent though, but you can use it whenever needed for a party. You just need to carry with you your favourite essential oil and massage on your lips for a couple of minutes. This will quickly give your lips a bigger look. You can use either peppermint essential oil or cinnamon essential oil. Mix it with your favourite lip balm and leave it on lips for 5 minutes. Then wash it off.